[ In November 2016 and in June 2018, there were discussions at the Swedish Parliament which featured MK Sharren Haskell, chair of the Knesset Lobby for UNRWA Reform, and two Israeli journalists, Dr. Arnon Groiss and David Bedein, who have been examining the new school books that the Palestinian Authority and UNRWA have been using. Churches in Sweden have for several years chosen to give large sums of collections of alms and collected church fees to private schools in areas ruled by the Palestinian Authority. The former state church, the Church of Sweden, has collected money for the school of the Swedish Jerusalem Association, the Good Shepherd’s Swedish School in Bethlehem, while free churches, the Swedish charity collection Världens barn, the foundation Läkarmissionen and the Swedish Consulate General in Jerusalem have collected and donated money to the schools of the Swedish International Relief Association (SIRA) in Bethlehem and Jericho. Together they have donated millions of Swedish crowns annually to Palestinian Arab schools that use textbooks glorifying violence and spreading anti-Semitism. On the website of the Swedish Jerusalem Association the arguments for supporting the activities of the association are presented. One of the arguments mentioned is ”the future of peace.” The Swedish association uses its school in Bethlehem as an example of ”the future of peace.” At the school “Christian and Muslim children learn to work together for the future of the country,” writes the association. Education and the future of peace are important causes to support. But there is no education for peace for the Palestinian Authority students either at the school of the Swedish Jerusalem Association or at the SIRA schools. On the contrary, the children at the Swedish-funded schools learn a violence-promoting message. And Israel does not exist on the maps of these schools. The non party political independent think-tank Perspective on Israel which I represent has recently examined some of the textbooks used at the schools. We have had a look at photos and videos from the Palestinian schools that receive funding from the Church of Sweden and other churches and charity organisations. 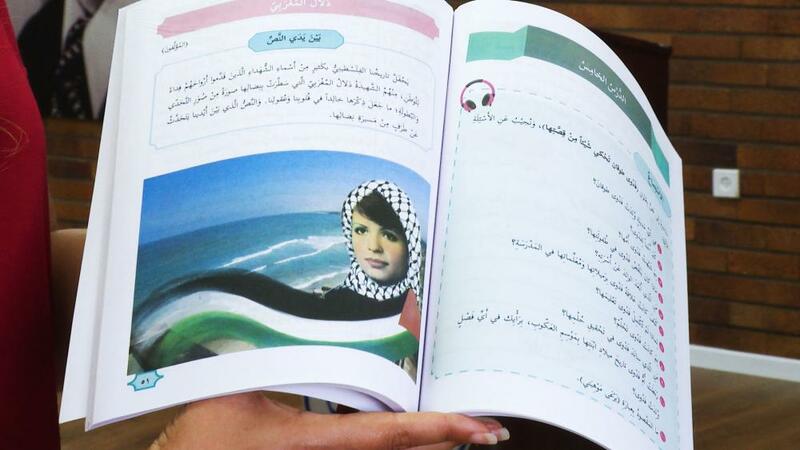 In the photo material from the schools’ own Facebook pages, we have been able to identify the latest textbooks of the Palestinian Authority, as these are available on the Palestinian Authority’s website. We translated and analyzed them. It turns out that the content of these books promotes violence and anti-Semitism. The textbooks are mandatory in all Palestinian schools, including private ones, in the Palestinian Authority territories according to Palestinian Authority law. There are texts in the textbooks from third grade and up, in which the students are encouraged to sacrifice their blood and annihilate ”foreigners”. In the textbooks, the students are also told to sing and memorize violence-promoting poetry. Dalal Al-Mughrabi, a female Palestinian Arab suicide bomber and terrorist, is described in poetic terms in the textbook ”The Arabic Language”, Part 2 for Grade 5. In the textbook Al-Mughrabi is praised for her terror act in 1978, in which 13 Israeli children were murdered. In total, 38 civilians lost their lives when the terrorist blew herself up in a bus. Jews are associated with lies and fraud in anti-Semitic texts in the Islamic Education textbook for the 12th grade. Jihad, ”holy war”, is also part of the curriculum. And these are just a few examples of the violence-promoting and anti-Semitic content of the textbooks. There will be no peace in the Palestinian schools in the PA territories as long as hatred and violence are present in the textbooks. I therefore ask the concerned Swedish churches and organisations collecting money for the Palestinian schools, to pay attention to the evidence indicating that violence-promoting extremism and anti-Semitism are taught in the schools in which the Swedish churches and organisations are involved. Actually, the Church of Sweden and the other churches and associations that have donated money to the schools can help the Palestinian Arab students to be liberated from the violence-promoting and anti-Semitic propaganda they are exposed to in their textbooks, by making demands on the Palestinian Authority to discontinue its anti-Semitic war curriculum. If the demands are not heeded by the Palestinian Authority, it is time to take action and cancel the support for the PA schools that glorify violence and terror. I think children should be protected from violence-promoting messages. What happens when children are subjected to violence-promoting propaganda is a serious form of mental child abuse. And the Palestinian children have been subjected to this crime for years in the schools that have received Swedish aid. The consequences are continued Palestinian terror and pain on both sides of the Israeli-Palestinian conflict. The Palestinian textbooks will become a key issue for the Swedish Christian churches in the future.